This is the site of surveyor malpractice that fifty years later would result in a lawsuit between Colorado and New Mexico that, in the end, only validated the original error. In 1868 Ehud Darling was charged with establishing the boundary between New Mexico and Colorado on the 37th parallel. 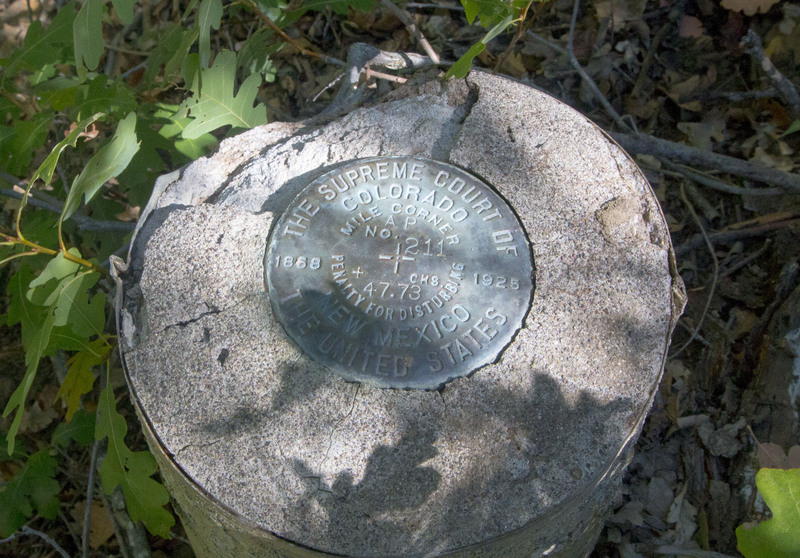 He moved slowly west from the Oklahoma line (even that location was found to be erroneous) at every survey monument he would, to simplify, swing his transit exactly 180 degrees from the previous monument to the one past his current location. Or so he thought. It was standard practice to double-check latitude by making astronomical observations periodically. So it was here, in a narrow canyon, that Darling came to his senses, and moved northwest up the canyon 3/4 of a mile, where he reestablished the line much closer to the intended latitude. 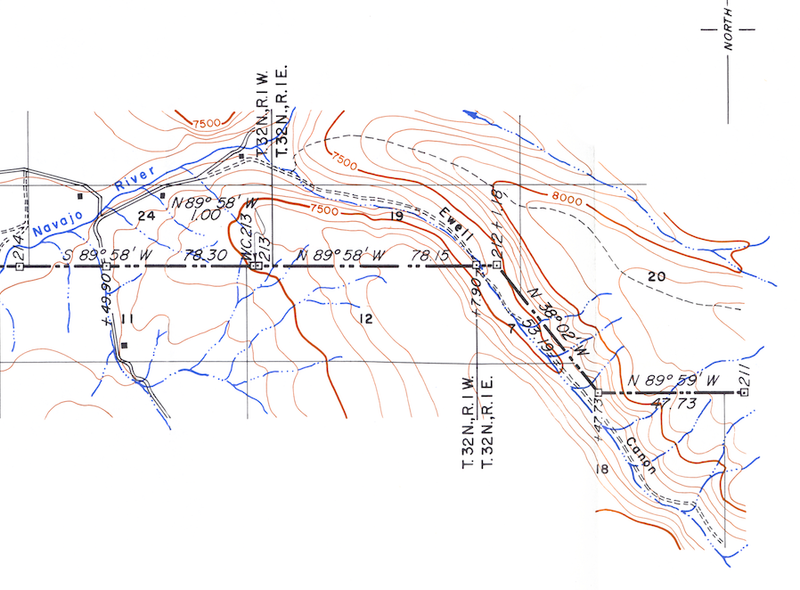 Now, in 1902, Howard Carpenter, who’d recently completed the Arizona-Utah border survey, was hired by the US Geological Survey to correct Darling’s erroneous line. He obliterated all of Darling’s monuments, as is common practice. The resulting survey, accepted by Congress, was rejected by President Roosevelt. Carpenter’s survey, now the only monumented border, lay in legal limbo. Eventually New Mexico took Colorado to court to validate Carpenter’s survey, which would New Mexico to reclaim the skinny sliver of territory– 3/4 mile at its widest by 211 miles long. Finally in 1925, the Federal Court ruled in Colorado’s favor, requiring a new survey to essentially replicate Darling’s malpractice. So Arthur D. Kidder dutifully, and quite precisely, obliterated Carpenter’s monuments and placed replica markers where Darling’s had been. 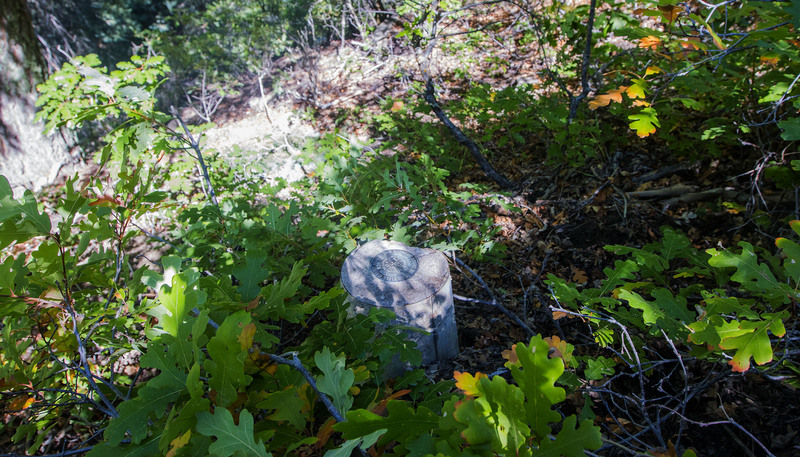 Below is the pivotal monument, hidden in oak trees half way up the east slope of Ewell Canyon. The border, it turns out, rarely intersects with its architected line at 37 degrees north latitude.